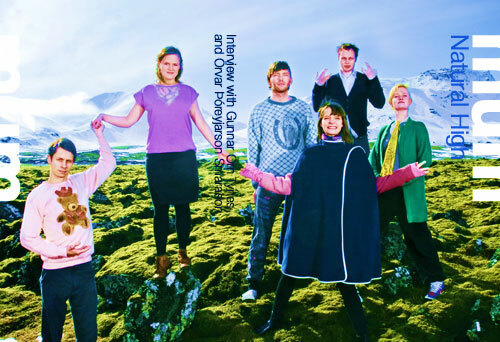 Following the departure of Kristin Anna Valtýsdóttir, gone to marry Avey Tare a couple of years ago, Múm founding members Gunnar Örn Tynes and Örvar Þóreyjarson Smárason rounded a few long term friends and, as a sextet, went on to record their most joyful and flamboyant record with Go Go Smear The Poison Ivy. Here, we caught up with the pair during their current tour to talk about dealing with Kristin’s departure and the ever-changing nature of the band, how the new album came to life, working on satellite projects and beans on toast. The new album is just out. Is it a stressful time for you with all the promotion, waiting to find out how it is received by critics and by the public, or is it more a relief to have the project done and dusted? Of course it is always very fulfilling to finish an album, but it was pretty much completed in autumn last year, so that’s a long time ago and your mind starts to wander into thinking about the next recordings and next album. In 2005, Kristin Anna Valtýsdóttir left the band. How did you deal with her decision? Did you have doubts on whether you would continue as Múm? No, we never had any doubts about keeping on, we had already started recording the album and it was going fine. It was more just a good thing to sharpen what was going on for us anyway. It’s always good to move on. How did the new band come together? What were you looking for in the musicians you wanted for the band? Well most of them have been playing with us on and off for a long time. It was more just a feeling of getting people to step up. We are all really good friends and that makes it easiest. The only person who is completely new is Silla and she fell into the whole group on the first day. With seven people in the band now, has it changed the dynamic a lot in the way how songs come together and how they are written? Was that a very natural process or did you have to change the way you work radically? Eiríkur and Samuli wrote many of the songs with us and that was a great experience. It did open things up more. But we keep our natural process of working still and we could never really define what that is anyway. You recently said in a recent interview that it is in the nature of the band to keep changing. Do you see this as a natural evolution? We have never pushed any changes…. they just happen. We have never made the same album twice and we are lucky that we have never had to put any effort into that not happening. And with the people side of things, we come from a background and a community of bands that keep changing and interacting with each other and most of us have played in many different projects together before and still do. Go Go Smear The Poison Ivy is a much happier and upbeat record than what you have released in the past. Were you conscious of this when recording? It is a lighter and a more open album, that’s very true. It wasn’t so much of a decision as something that was unavoidable for us. We can’t get much darker than Summer Make Good. Well, maybe we can… yes on second thought I wouldn’t like to exclude that possibility either. You record your albums mostly in Iceland. Is it important for you to be home when recording? No. We usually travel around when we record. We don’t stay around in the same place much. The reason it happens in Iceland is that it is often quite simple to find a place and it’s easy to get people to the recordings. We did record a part of this album in Finland and we are sure to do that again. In 2002, you released a version of Finally We Are No-one which was all sung in Icelandic. What did you think it brought to the project, and would you ever consider do something like that again? Hmmmm, yes we did that just as a simple experiment or just to see if that was for us. To tell the truth people in Iceland have never been that much into our music and the Icelandic version was mostly bought by people outside of Iceland as a novelty. I don’t feel a special pressure to make our music more acceptable to Icelanders, the politics of the music press there are so complicated that it would be a full time job to get into the good books. You partly recorded in a music school in a small town in the west of Iceland, using the school’s instruments. Was it your intention to use only the school’s instruments, and how did it work out in the end? Our intention was never to record in that school at all, we went to this town to find a place to record and then we almost started recording in a fishing factory, but then we got a no from the factory owner. That would have been horrible anyway because of the cold and the noise, but out of nowhere we suddenly had the keys for the music school. The people in Ísafjörður are just so warm and amazing. Örvar and Gunnar, you have produced a few remixes over the years, the most recent ones were a couple of tracks by Goldfrapp. How do you approach that kind of work, and how do you decide to remix a particular track? That’s another question I can’t give you a straight answer to. Ha ha, sorry about that. I don’t really know, our lives are often quite chaotic. We had fun working on the Goldfrapp songs, but we haven’t really done as many in the last few years as before. And we haven’t been doing as many as we would maybe like to. You also worked on a commission from the Holland Festival to create a piece based around the work of Iannis Xenakis with the National Dutch Chamber Orchestra. How did you work on this? Was this a very different approach to music, and how did you feel about the finished work? Will you ever perform it again? It was a great experience in every way. We worked in the music hall for about a week, we got a great room for it and it is very good for us to explore a very new way of working. Playing with the orchestra was a rewarding time and inspired new things for the album. Some years ago, you provided the music for your version of the soundtrack of Sergei Eisenstein’s Battleship Potemkin, which you performed in Iceland and a few other places. How did you get involved with this project, and how did it differ from working on one of your records? We had done a lot of improvisations to different silent films and when we were asked to write a new score to a film of our choice and record it, we just welcomed it. We ended up picking Potemkin, because it seemed like the film it would be the hardest for us to compose to and it turned out to be right. The rhythm of the film is so difficult to work with and the atmosphere in the film itself has so many hidden layers. And then you need to work it out in a historical sense as well. We were never going to make something similar to the many early soundtracks by Meisel and Shostakovich for example. Would you consider working on another soundtrack, and for which kind of film? Sure we are very open to that. Maybe we could do shorter soundtracks to early animation films. That has been something we have wanted to do for a while. The artwork for the new single and album and the video for They Made Frogs Smoke ‘Til They Exploded were created by Ingibjörg Birgisdóttir and DLT. Do you see this as part of the overall project? Do you attach a lot of importance to what your records and videos look like? Yes, it is a part of the whole thing. We have mostly worked on the artwork ourselves for our albums, but this time we gave the whole thing to our old and good friend Inga and we always knew she would make something as amazing as she did. Everything she puts her hands on turns into gold. You are just starting touring with the new album. What can people expect to see on stage? We have been touring it for a while now and it is for sure our most enjoyable album to play live. I don’t want to tell people what to expect, that’s none of my business, but I would like to bid every one welcome to come and see it for themselves. You are currently scheduled to tour until the end of December. How do you deal with being away from home for so long? It gets tiring sometimes, but you turn into part robot, part travelling minstrel. All in all it’s very fun and it’s great to be around your friends. But it’s hard to miss someone who is back at home. What is next for Múm? More touring, more music, more albums, more things we don’t know about. More beans on toast and more damp pillows that smell like rhubarb.